For those teachers and guitar students that know the RGT syllabus, you might also be excited to know that RGT also offers a range of professional teaching qualifications for bass and acoustic guitar teachers. RGT provides a range of specialist teaching qualifications for acoustic and bass guitar teachers. 3. LLCM(TD) – Licentiate Teaching Diploma of the London College of Music. Successful candidates are legally entitled to append the appropriate letters to their name. The Diplomas are awarded in conjunction with London College of Music Exams and are accredited by Thames Valley University and recognised by the DCSF (Dept. for Children, Schools and Families) as a recognised qualification. Read more about each of these exams at the following RGT.org pages. 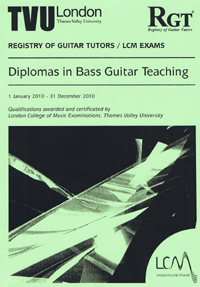 Whilst playing ability needs to be sufficient to ably demonstrate musical examples and techniques to students, the focus in all these new Diplomas is the ability to ‘teach’ bass or acoustic guitar and the examiner(s) will observe the candidate’s teaching. This can be done either by conducting a lesson during the examination or via the submission of a videoed lesson. The tables that follow outline all the components of the new Teaching Diplomas. The overall structure is broadly similar for both bass and acoustic guitar, with the main differences being highlighted in each section. A ‘Fingerboard Knowledge’ component is included to ensure that candidates can demonstrate proficiency in, and knowledge of, these core technical skills. Candidates are required to perform from memory a selection of scales and arpeggios (and chords for acoustic candidates) and are left free to research or devise their own fingerings for these. During the ‘Lesson’ component bass candidates are expected to focus on teaching the ‘Performance’ section of an RGT bass grade, but also cover the ‘Bass Patterns’ section. Acoustic candidates are expected to focus on the ‘Performance’ section of an RGT acoustic grade, but also cover the ‘Accompaniment’ section. The ‘Presentation and Demonstration’ component provides the candidate with the opportunity to demonstrate their approach to teaching bass or acoustic guitar. At this level, candidates should give a presentation of approximately twenty minutes on aspects of their teaching skills. This also provides an opportunity to expand and develop upon the elements incorporated in the lesson component. Although the main focus here will be the standard of pupil selected for the lesson component, candidates are expected to be familiar with the material and requirements up to, and including, Grade 8. The Presentation and Demonstration component leads into the ‘Discussion’ component where topics from the previous sections can be addressed more fully. For the ALCM essay component the candidate should select a topic from the list given in the relevant syllabus and submit this with their application for the exam. The essay topics cover issues such as approaches to group tuition, guitar teaching resources and methods of motivating and inspiring pupils. The essay needs to be approximately 4,000 words and should include musical examples. The lesson component is similar in format to the DIPLCM(TD), although slightly longer in duration and the examiners will be expecting to see a more detailed understanding and demonstration of the teaching process. Similarly, the presentation and discussion components will be slightly longer and more detailed than for the DipLCM. For bass guitar a (prepared) sight reading test is presented in standard notation for both ALCM and LLCM. The range of possible keys, time signatures, and rhythmic and melodic complexity is greater for LLCM candidates. As sight reading standard notation is not a core skill used by most acoustic guitarists, acoustic candidates are instead given a chart reading test in which they will be shown a chord progression and are then required to play it using a fingerstyle technique and embellishing the basic chord symbols to produce an effective musical result. At LLCM the range of time signatures and chords increases and a greater level of musicality and technical ability is expected compared to ALCM. The LLCM dissertation is a three-part submission comprising: Case Studies, Players and Styles, and Essay. As with the ALCM this is submitted with the exam application. The ‘Case Study’ details the progress and assessment of three pupils and also allows the candidate to assess their own achievements with the pupils during this period. This is essentially an observation and assessment of the teaching process over a period of between 6 and 12 months. It should provide a detailed overview of the progress made by the selected pupils and an appraisal of the achievements made by the candidate. This should be between 2,500 and 3,500 words. The Players and Styles element is a comparative study of three high profile bass or acoustic guitarists of the candidate’s choice. Particular reference should be made to the styles of music and playing techniques utilised as well as drawing on how this information can be utilised within a teaching environment. This study is between 1,500 and 2,500 words. The Essay section requires the candidate to select a topic from the syllabus list, which covers more general teaching issues and approaches but with an emphasis and application for the bass or acoustic guitar. At this level candidates are expected to demonstrate a greater insight and understanding into all aspects of the teaching process. For example, one of the essay titles for acoustic candidates is: “Discuss how you would approach teaching a student the RGT grades 6 to 8 acoustic guitar exams. The lesson component is similar in format to the previous diplomas although slightly longer in duration compared with the ALCM. The examiners will be expecting to see a demonstration of proficient and authoritative teaching skills at this level. The duration and depth of detail will increase for the presentation and discussion components at this level. Unless they have Grade Eight in the same instrument, DipLCM(TD) candidates are required to have passed the LCM Grade Five popular music theory exam (or any one of a range of equivalents listed in the syllabus). Candidates who have not already taken a Grade Five theory exam (or equivalent) can simply enter for this at the same time as entering for the Diploma; the diploma being awarded upon passing both. In order to provide a progressive (and more successful) study route for candidates, ALCM(TD) candidates should normally have passed the DipLCM(TD), and LLCM(TD) candidates should normally have passed the ALCM(TD) before entering, although suitable alternative prerequisite qualifications will be accepted (see syllabus for details) and those with sufficient teaching experience of the instrument (three years for ALCM and five years for LLCM) can enter direct. In the UK, Diploma exams are held three times a year, during the same periods as the RGT’s grade exams: Spring (March/April), Summer (June/July) and Winter (November/December). Overseas candidates should contact their RGT national representative for details of examination dates. DipLCM examinations may be held at a wide range of regional exam centres. Associate and Licentiate diplomas are normally examined by a panel of at least two senior examiners and, dependent upon the number of entrants from each area, these examinations may only take place at a limited range of exam centres. Do you have a question or comment about the RGT Bass and Acoustic Guitar Teaching Diplomas? Share your thoughts in the comments section below. This entry was posted in Acoustic Guitar Exams, Bass Guitar Exams and tagged RGT Guitar Teaching Diplomas by Alan. Bookmark the permalink.